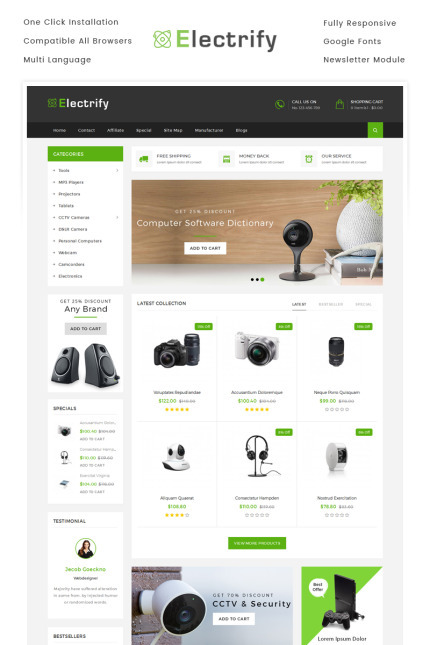 Electrify Electronics Store Opencart Responsive template is designed for Electronics, Digital, Camera, Computers, Deals, Appliances, Mobile, CCTV, minimal and multi purpose stores. Template is 100% responsive with all devices and compatible with all browsers. This theme is unique for sale any digital and electronics items. This template support multi language and multi currency. It's available with quick start installation package for easy installation with only one click you can see your store like our live demo store.